shopnewbalance.com: New Balance 768 has arrived! New Balance 768 has arrived! Attention all of you 767 wearers! The New Balance 768 is here on NBwebexpress.com. 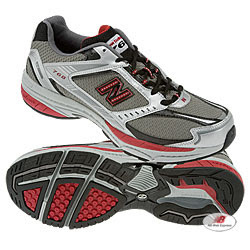 I own a pair of the 767's; actually they were my first official pair of New Balance shoes I purchased at NBwebexpress.com. I had worn neutral cushioning shoes for years thinking I had a flawless running gait with no need for extra support. I completely ignored the small pains in my knees and back; I just wrote those discomforts off as "getting older" or "running too hard" or whatever. But as it turns out, I needed more support. The 767's were perfect for me since they were supportive but not "clunky." I still had that "light" feeling in my toes as I ran. But, you may wonder, (and I did as well) what makes the 768 different from the 767? Why fix what isn’t broken, right? The 768 has more room in the toe box; so if your feet tend to move in the shoe or your toes tend to feel a little scrunched, this new fit adjusts the feeling. The new N-Durance® Heel Crash Pad also gives a better fit in the heel area, giving you more comfort and shock absorption. You can still count on the comfort and cushioning you've grown accustomed to with the 767, but you now have some added updates to make your running experience even more enjoyable. So, if you love the 767's, I don't think you'll be disappointed with the 768's. The new features will keep your feet comfortable and well supported so you can concentrate on the miles ahead!